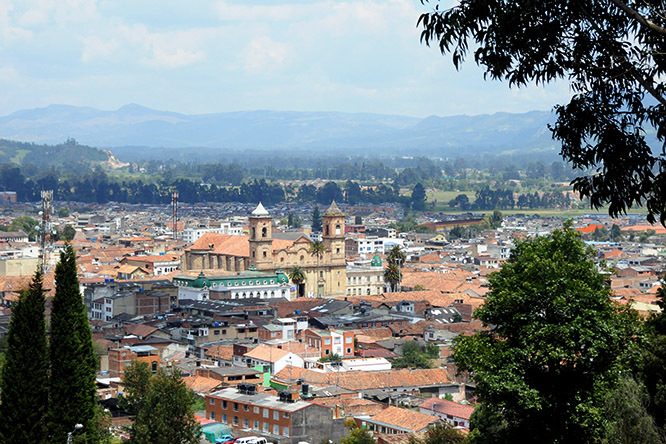 Just a short hour bus ride north of Bogota is the city of Zipaquira. 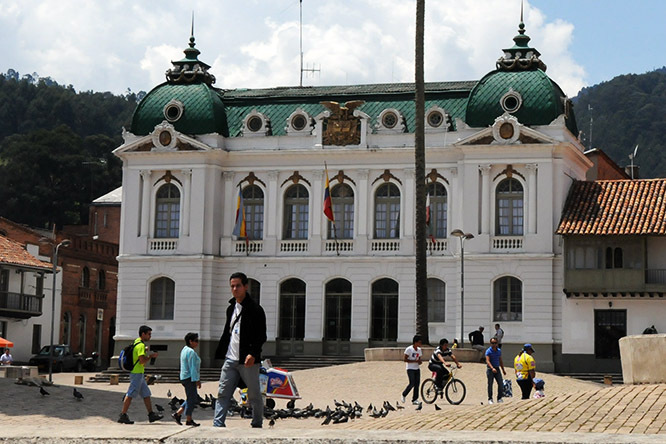 The city is over 400 years old with lots of history and is a popular visit for both Colombians and tourists. It has a population over 100,000, so it’s a perfect small city and a great weekend destination for those staying in Bogota. 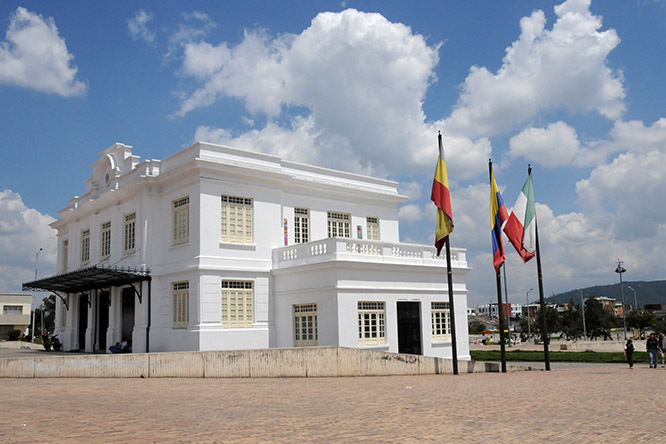 From these shots which show the governor’s mansion above and the main plaza below, Zipaquira looks like a typical historic South American city. Most parts are, but I have to admit that sometimes I felt more like I was in an amusement park rather than a city. While near the center of Zipaquira I saw a small tourist train that was driving people through the streets giving tours. 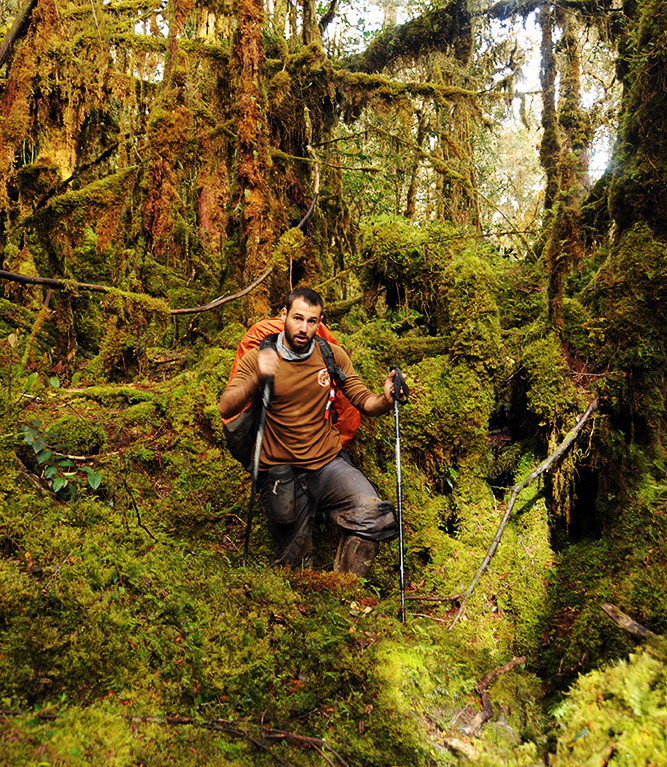 There are also things like rock climbing walls and other attractions you might not expect to come across in the middle of Colombia! Regardless it’s a fun place to visit, and when I was here the weather here was perfect and with all the restaurants and shops available it’s definitely worth the easy trip from Bogota. My main reason for visiting Zipaquira, and probably most visitors as well, was to see the famous ‘Salt Cathedral’. The history here is pretty impressive. It’s estimated that over 3,000 years ago Native Americans belonging to the Muisca tribe began exploiting the mine for its salt. 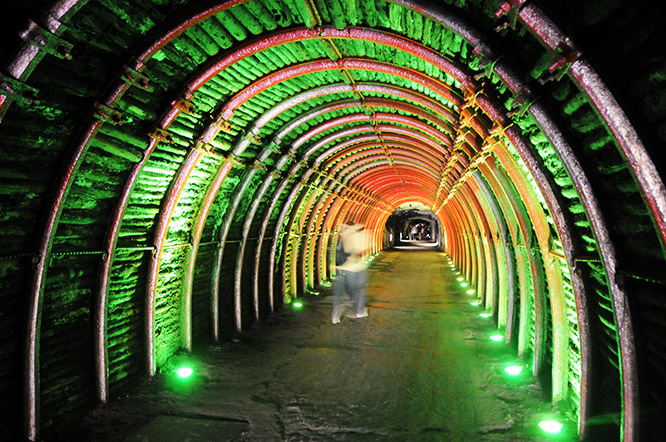 The mine continued to be used to excavate salt throughout the next few thousand years into the 19th century. 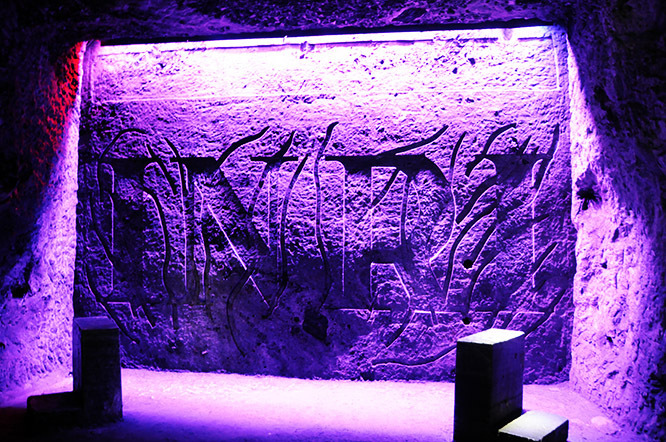 The photo above shows the main entrance into the Salt Cathedral. I imagine it looks pretty different than it did 3,000 years ago. Below is an illuminated sign near the entrance, but I’m not sure what Inri means. 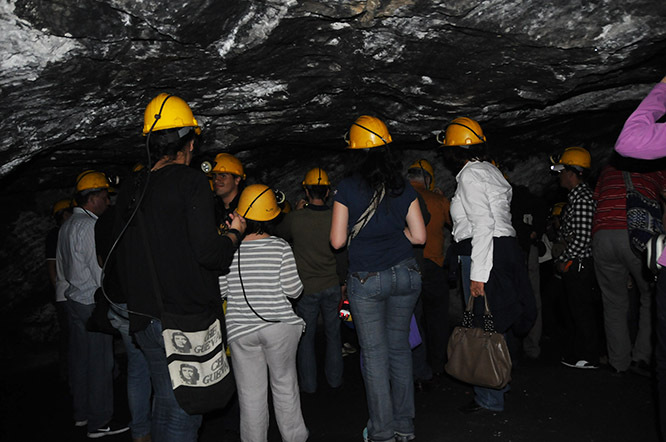 You can explore the cathedral on your own, but to explore the mine, you’ll need to be guided in by locals and even wear a miners hat. The photo above is of the group that I went with; at least a dozen of us. The tour was actually one of the most annoying experiences in my life. It was way over booked and we had to wait in a line forever in pitch black darkness before we could get moving. We all had helmet lights and were told to keep them off, but every once in a while someone would randomly turn theirs on for a second making everyone else in the tour start screaming at the sudden blinding light. Eventually when things got moving and I able to get into parts of the old quarry. Once there it’s not so annoying anymore and even was a bit fun. They let us swing a pick at the walls if we wanted to see what mining was like, and you’re even allowed to keep the piece as a souvenir! 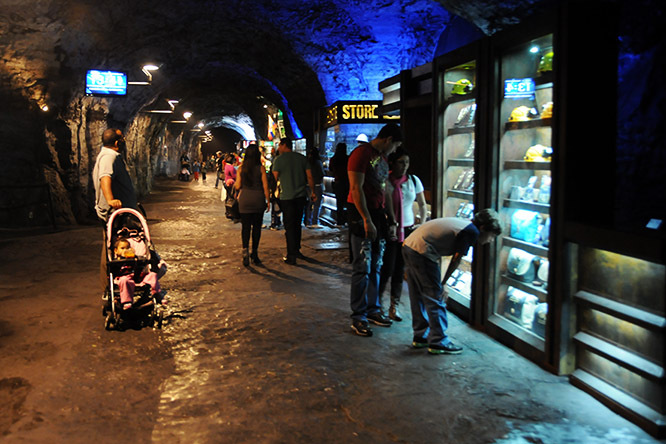 If you don’t feel like earning your souvenir, the mine even has it’s own shop photographed below. One last photo before I get to the actual Salt Cathedral is this memorial above. It’s dedicated to all those who lost their life while working in the mines. Because the miners worked so deep inside and the work was dangerous, it was actually them who created the Salt Cathedral to give them a place for their daily prayers. 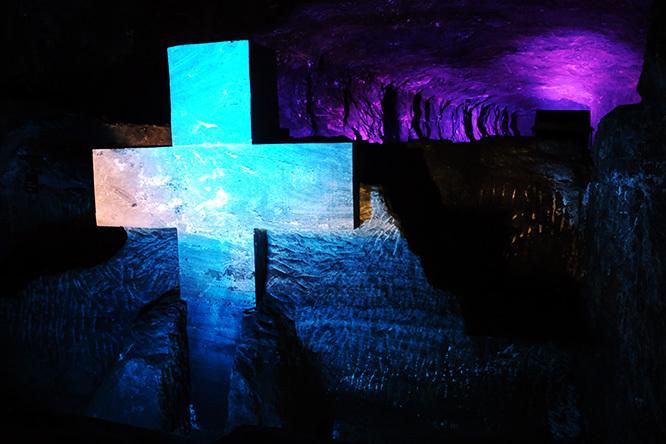 Although small altars had long existed in the mines, the true Salt Cathedral wasn’t built in the 1950’s. In 1991, it was essentially replaced by the ‘new’ Salt Cathedral. Sadly somehow I only have two photos from the rest of the Salt Cathedral, or even park as some call it because it’s so huge. Above you can see a good example of what most of the long caves from the mines now look like. There are large crosses and other religious items cut out from the walls and illuminated by colorful lights. One room even has a reflecting pool in it. 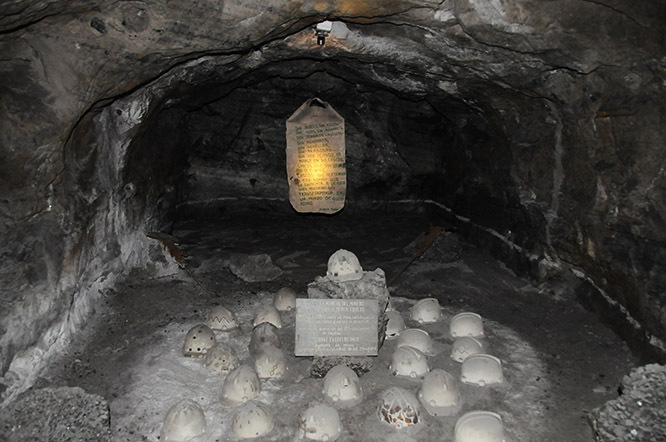 This photo above shows the main altar in the Salt Cathedral. 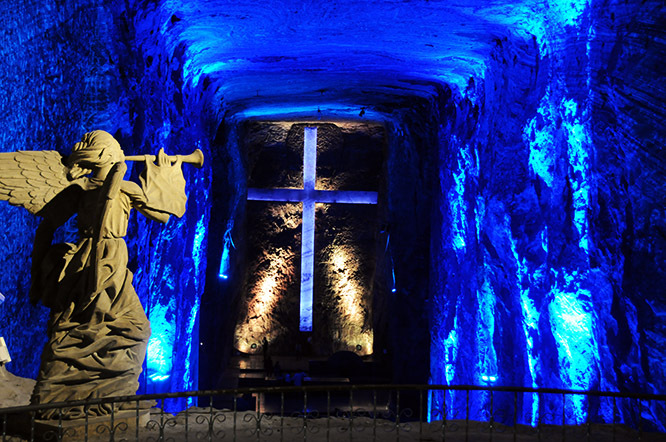 The Salt Cathedral doesn’t actually have a bishop, so therefore it’s not officially considered a Catholic church. However, as many as 3,000 people visit here on Sundays for religious ceremonies. Other places of interest inside include the brine museum, auditorium, and the Salt Dome.